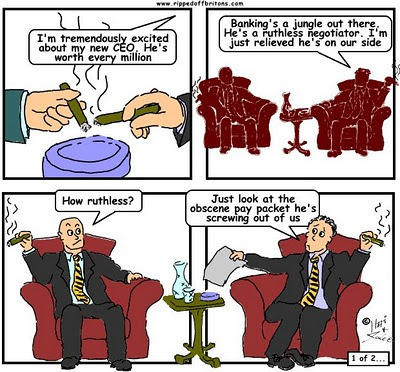 Over 500 bankers earned more than £1million at RBS and Barclays in 2012, with 50 paid between £2.5 million and £5 million. HSBC paid 204 bankers more than £1 million, with its five highest paid staff receiving between £3.9 million and £7.5 million. Bankers have been permitted by successive governments, Labour and Conservative and Coalition, to loot in a way unseen in any other industry. Excessive bonuses are paid to the bosses of many industries: for example in 2013 the CEO of Centrica arranged to leave that company accompanied by a hearth warming £10m combined share, salary and pension package. 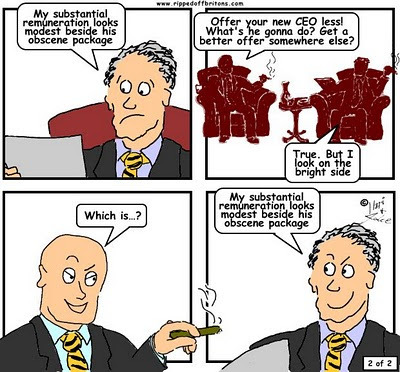 The difference is banks hose cash over staff well below top-boss level. None of this is news, but every now and then the bare-faced cheek of one bank is exposed by the relatively less spewing bonuses paid by another bank. From basic measures, taken in March 2013, Lloyds appears in better shape than RBS. Lloyds total value was double, its revenues 27% higher, and its losses seven times lower than RBS. 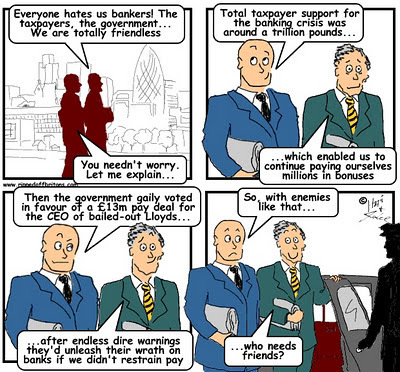 And yet Lloyds' is paying relatively less ludicrous bonuses compared to RBS. Lloyds is led by Antonio Horta-Osorio who was the first bank CEO to stop fighting against paying compensation to customers ripped-off in the Payment Protection Insurance scandal, resulting in the other banks also throwing in the towel. The same Horta-Osorio who, having started as CEO in March 2011 got so stressed by what he saw that he suffered insomnia through the summer, and took a few weeks off sick later the same year. Could he be a man with enough humanity to be revolted by British banking culture? It’s too early to tell. Horta-Osorio seems confident he won't lose the competitive edge by holding back on the bonuses. After all, the question should not be whether staff will leave if they don't get a fat enough bonus. The question should be whether staff who leave can be replaced. As we have pointed out, the maths shows banker performance matches random chance. They are eminently replaceable. In contrast, the prime question occupying the directors at RBS seems to be how much bonus they and their favoured staff can get away with before the owners do anything about it. The owners being, of course, us British taxpayers represented (disappointingly) by our government. "The emoluments of the Chairman [of the John Lewis Partnership], who was also the highest paid director, were £954,000 (2011: £950,000), including Partnership bonus of £115,000 (2011: £142,000)." "The pay of the highest paid Partner will be no more than 75 times the average basic pay of non-management Partners, calculated on an hourly basis"
And yet John Lewis manages to recruit staff from chair salesmen to chairman that managed a strong 2012 without resorting to showering them with cash. How much longer will the British Government pretend it is powerless to do anything about excessive pay in the financial sector because the other countries won't cooperate? The EU is legislating a cap on banker bonuses of up to 200% of salary (compared with John Lewis’ 17% of salary bonus per person regardless of rank for 2012), and all our government will do is fight to stop the EU and protect bankers' pay. Even the Swiss, famed for services to tax dodgers, voted in March 2013 for a change to their constitution to control excessive pay, banning ‘golden hellos and goodbyes’ completely and giving shareholders a binding vote on company remuneration. John Lewis makes its money selling kettles and frocks at a high price in a posh environment. Their kettles don’t boil water any hotter than those available for a song at Wilkinsons. The frocks are no more frightful than those available at far less frightful prices in Marks & Spencer. But the people who walk into John Lewis, or pick up a bottle of Jamesons at Waitrose, walk with full knowledge that they pay extra for the fragrant environment and the company of more fragrant fellow shoppers who appreciate that fragrance. Banks make their money promising prosperity and security but delivering the opposite: Payment Protection Insurance scams; Libor rigging frauds; Interest Rate Swap rip-offs. They boost their profits by paying risible returns on savings and investments, and taking excessive charges and extracting well hidden penalties. What you get in return for paying stonking bonuses is a banking system run by people chasing stonking bonuses. You get bankers with no compunction about pulling off the frauds and deceits, regardless of the harm it does people and companies, that are the only way they can pay themselves their stonking bonuses. For a more fragrant banking sector, stop excessive pay to stop pulling in those who want to enrich themselves. Recruit leaders who want to be good bankers more than they want to be millionaires. "Barclays investment boss Rich Ricci trousers £18m shares bonus despite Libor scandal....Barclays new chief executive Antony Jenkins, who also agreed not to take a bonus for last year, picked up 1.8 million shares worth £6million and immediately sold half - netting him £2.9 million." Shame John Lewis continue to contract out cleaning and call centre staff, not quite the partnership we're led to believe. and as to how much tax was paid and where the money resides?